The 7820B is simple to use, durable, accurate and reliable. 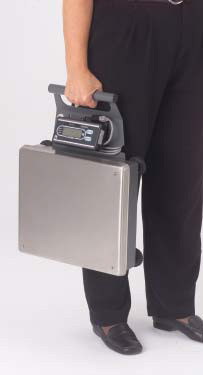 This NTEP approved scale fits into any operation as a Portable stand-alone scale, Rechargeable sealed lead-acid battery installed with each unit. Field Calibration– Alternate span points, 10 or 50 lb, can simplify fi eld calibration. Can be set up either in decimal pound or kilogram. 12" x 14" 12" x 14"
12" x 14" x 4.1"
RS-232, bi-directional, confi gurable 1200-19.2K. Transmits weight and scale status whenever a "W" <CR> is sent by remote device.